The Mission is a neighborhood of strong character and a sense of community developed over decades. This area is home to almost 60,000 people, with Latinos comprising over half the population. The Mission is bounded by Guerrero to the west, Potrero to the east, Division to the north and Cesar Chavez to the south. In addition to providing more than 23,000 jobs for the city of San Francisco, the Mission also provides a place for almost 60,000 residents to live, many in households substantially larger and poorer than those found elsewhere in the City. There are about 17,000 units of housing in the Mission mixed with commercial, industrial, retail and other uses. This mix of uses makes it possible for many residents to live and work in the same general area. Retail is a significant business type in the Mission. Mission and 24th Streets in particular offer a variety of shops and services including many small grocery stores, beauty shops and restaurants that serve the local neighborhood and reflect the Latino population. There are about 900 stores and restaurants in the Mission, employing nearly 5,000 people. Retail however, does not employ as many people as Production Distribution and Repair (PDR) activities. PDR businesses, concentrated in the northeast Mission, provide jobs for about 12,000 people, making PDR businesses the largest employers in the Mission. These businesses support San Francisco’s service and tourist industry and are comprised of everything from furniture makers, sound and video recording studios, wholesale distributors, auto repair shops, plumbing supply stores, lumber yards, and photography studios, to the large PG&E and Muni facilities. The Mission is known for its rich culture. It hosts annual public celebrations such as “Carnaval”, “Cinco de Mayo” and “Encuentro del Canto Popular” and houses a variety of community and cultural resources including Centro del Pueblo, the Mission Cultural Center, the Mission Economic Development Association, ODC, Cell Space, PODER, Saint Peters Housing, Dolores Street Community Services, the Bay Area Video Coalition, The Mission News and El Tecolote newspaper. Perhaps the most visible cultural resource however, are the many murals found throughout the area. These themed illustrations on the sides of buildings provide an historic and cultural context for residents and visitors alike. Overall, the Mission has a well-developed neighborhood infrastructure, easy access to shops and restaurants, an architecturally rich and varied housing stock, rich cultural resources, and excellent transit access. Traditionally a reservoir of affordable housing relatively accessible to recent immigrants and artists, housing affordability in the Mission has significantly declined in the past decade as condominium conversions have removed affordable rental housing and evicted low-income residents and families. Moreover, new housing has been largely unaffordable to existing residents, and constructed on land formerly occupied by PDR businesses. 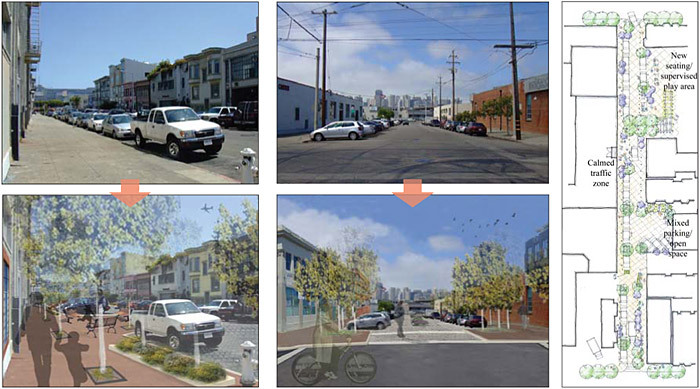 This section presents the vision for the use of land in the Mission. It identifies activities that are important to protect or encourage and establishes their pattern in the neighborhood. This pattern is based on the need to increase opportunities for new housing development, particularly affordable housing, retain space for production, distribution and repair (PDR) activities, protect established residential areas, and build on the vibrant neighborhood commercial areas around Mission, Valencia and 24th Streets. Where and how these activities occur is critical to ensuring that future neighborhood change contributes positively to the city as well as the area’s vitality, fostering the Mission as a place to live and work. To ensure the Mission remains a center for immigrants, artists, and innovation, the established land use pattern should be reinforced. This means protecting established areas of residential, commercial and PDR, and ensuring that areas that have become mixed-use over time develop in such a way that they contribute positively to the neighborhood. A place for living and working also means a place where affordably priced housing is made available, a diverse array of jobs is protected, and where goods and services are oriented to serve the needs of the community. For the Mission to continue to function in this way, land must be designated for such uses and controlled in a more careful fashion. Much of the Mission is mixed-use in character. Neighborhood commercial areas such as Mission, Valencia, and 24th Streets support a variety of activities, including shops and services, housing, small offices, and PDR businesses. Residential areas contain some small corner stores and other neighborhood-serving uses. The Northeast Mission is home to a unique mixture of activities which includes many important and successful PDR businesses, as well as offices, housing, retail and other uses. This mix of uses contributes to the vitality of the Mission and should be retained. Generally maintain existing neighborhood commercial zoning in the Mission and Valencia Corridors, including portions of 16th Street, but recognize the good transit service available here by eliminating density limits and parking minimum requirements. Eliminate density limits and minimum parking controls in some residential areas of the Mission which are close to Mission Street transit. In some parts of the Northeast Mission Industrial Zone, establish new controls that protect PDR businesses by prohibiting new residential development and limiting new office and retail development. In other parts of the Northeast Mission Industrial Zone, establish new controls that allow mixed-income residential development, while limiting new office and retail development. Revise land use controls in portions of the Northeast Mission Industrial Zone outside the core industrial area to create new mixed use areas, allowing mixed income housing as a principal use, as well as limited amounts of retail, office, and research and development uses, while protecting against the wholesale displacement of PDR uses. Maintain the successful Mission Street, 24th Street, and Valencia Street Neighborhood Commercial districts; recognize the proximity to good transit service by eliminating residential density limits and minimum parking requirements. In higher density residential areas of the Mission, recognize proximity to good transit service by eliminating density limits and minimum parking requirements; permit small neighborhood-serving retail. In lower density residential areas of the Mission, generally further from good transit service, maintain existing residential controls. Permit and encourage small and moderate size retail establishments in neighborhood commercial areas of the Mission, while allowing larger retail in the formerly industrial areas when part of a mixed-use development. Permit and encourage greater retail uses on the ground floor on parcels that front 16th Street to take advantage of transit service and encourage more mixed uses, while protecting against the wholesale displacement of PDR uses. Maximize active ground floor uses that open to the BART plazas in any redevelopment of the parcels surrounding the plazas. It is important that new housing be developed in appropriate areas, that it be compatible with its surroundings, and that it satisfy community housing needs. Locating housing in neighborhood commercial areas with good transit, as well as in some portions of former industrial areas, allows new development to capitalize on existing infrastructure. By increasing development potential on some parcels, reducing parking requirements, and replacing existing unit density controls with “bedroom mix” controls that require a portion of new units to be larger and more family-friendly, more housing of the appropriate type can be encouraged. For new construction, and as part of major expansion of existing buildings in neighborhood commercial districts, require ground floor commercial uses in new housing development. In other mixed-use districts encourage housing over commercial or PDR where appropriate. Identify portions of the Mission where it would be appropriate to increase maximum heights for residential development. A notable characteristic of the Mission is that even in its industrial areas, there exists a unique and varied mix of offices, retail, housing and other uses, in addition to PDR businesses. The intent of the Plan is to create successful mixed areas where PDR uses can exist and compete well with other uses in the future. To ensure that the Mission’s unique mix remains in place, existing office and retail establishments in the Mission’s mixed-use and PDR districts should be allowed to stay legally, as long as they were legally established in the first place. Property owners whose office and retail tenants leave should be allowed to replace them with similar tenants. Existing legal nonconforming use rules already provide substantial protections to certain types of establishments that pre-date the proposed rezoning. For example, in areas where limitations will be imposed under new zoning on retail and office uses, existing office and retail uses that do not comply with this limitation would be able to remain, provided they were legally established in the first place. However, existing nonconforming rules do not apply to housing where it is prohibited outright. Because new zoning will create such districts, the nonconforming use provisions in the Planning Code should be modified in order to allow for the continuance of existing housing in areas where housing will no longer be permitted under the new zoning. Continue existing, legal nonconforming rules, which permit pre-existing establishments to remain legally even if they no longer conform to new zoning provisions, as long as the use was legally established in the first place. Recognize desirable existing uses in the former industrial areas which would no longer be permitted by the new zoning, and afford them appripriate opportunities to establish a continuing legal presence. The PDR component of the Knowledge Sector could locate throughout the Mixed-Use and PDR districts of the Mission. The office component of the Knowledge Sector should be directed towards space above the ground floor in buildings in the Mission’s Mixed Use and PDR districts. The amount of office space in these buildings should be controlled, in order to support the continued viability of some PDR uses above the ground floor. R&D uses range from office-only to a mixture of office and production and testing activities. To the degree that these uses are office-only, they should be subject the same controls as office uses. The more industrially-oriented R&D uses could be located throughout the Mixed Use and PDR districts of the Mission, though the office component would be subject to office controls. Continue to permit manufacturing uses that support the Knowledge Sector in the Mixed Use and PDR districts of the Mission. Allow Knowledge Sector office-type uses in portions of the Mission where it is appropriate. Identify portions of the Mission where it would be appropriate to allow research and development uses that support the Knowledge Sector. MINIMIZE THE IMPACT OF NOISE ON AFFECTED AREAS AND ENSURE GENERAL PLAN NOISE REQUIREMENTS ARE MET. Noise, or unwanted sound, is an inherent component of urban living. While environmental noise can pose a threat to mental and physical health, potential health impacts can be avoided or reduced through sound land use planning. The careful analysis and siting of new land uses can help to ensure land use compatibility, particularly in zones which allow a diverse range of land uses. Traffic is the most important source of environmental noise in San Francisco. Commercial land uses also generate noise from mechanical ventilation and cooling systems, and through freight movement. Sound control technologies are available to both insulate sensitive uses and contain unwanted sound from noisy uses. The use of good urban design can help to ensure that noise does not impede access and enjoyment of public space. Reduce potential land use conflicts by carefully considering the location and design of both noise generating uses and sensitive uses in the Mission. RETAIN THE MISSION’S ROLE AS AN IMPORTANT LOCATION FOR PRODUCTION, DISTRIBUTION AND REPAIR (PDR) ACTIVITIES. It is important for the health and diversity of the city’s economy and population that production, distribution and repair (PDR) activities find adequate and competitive space in San Francisco. PDR jobs constitute a significant portion of all jobs in the Mission. These jobs tend to pay above average wages, provide jobs for residents of all education levels, and offer good opportunities for advancement. However, they usually lease business space and are therefore subject to displacement. This is particularly important in the Mission as average household sizes tend to be larger and incomes lower than the rest of the city. Also, half of Mission residents are foreign born with two-thirds coming from Latin America and Mexico. Half of all Mission residents are of Latino heritage. About 45 percent of Mission residents speak Spanish at home. PDR businesses provide accessible jobs to many of these residents. Stabilizes areas that contain concentrations of “blue collar”, unskilled and semi-skilled jobs. Ensure that any future rezoning of areas within PDR districts is proposed within the context of periodic evaluation of the city’s needs for PDR space. PDR districts proposed in this Plan were established to acknowledge and protect existing clusters of PDR activity and to provide an appropriate land supply to accommodate the city’s need for PDR businesses into the foreseeable future. Land use needs change over time, but case-by-case rezoning of individual parcels or groups of parcels within larger PDR districts would disrupt the integrity of the districts. Proposed rezoning should only be considered in the context of an evaluation and monitoring report of the Eastern Neighborhoods Plans, to be conducted by the Planning Department at five-year intervals. Flexibly designed buildings with high floor to ceiling heights best accommodate the PDR businesses of today and tomorrow. Such spaces, equipped with roll-up doors or other large apertures, for example, facilitate the movement of goods and supplies. Mission Street is well served by Muni and has two BART stations, at 16th and 24th streets. Directing new development along neighborhood commercial streets in the area, such as Mission and Valencia streets, increases their vitality as neighborhood commercial areas and takes advantage of existing transit infrastructure. A tremendous amount of this vitality is due to the unique character of the Mission’s neighborhood commercial areas, and that character should be encouraged and protected. Uses that are not community or neighborhood-serving should be managed in order to promote neighborhood serving and family-oriented businesses. To ensure compatibility with the existing scale of these areas, large lot development and lot mergers and business sizes should be carefully controlled. Because new zoning will allow for additional development capacity, more affordable housing should be required to address the needs of area residents and families. The existing Mission alcoholic beverage controls, restricting new bars and liquor stores, cover most of the Mission district. However in sections of Mission Street adult entertainment and tourist hotels are currently permitted with conditional use approval. To promote more community serving businesses in the Mission, these uses should be prohibited in neighborhood commercial areas. Direct new mixed-use residential development to the Mission’s neighborhood commercial districts to take advantage of the transit and services available in those areas. Ensure that the Mission’s neighborhood commercial districts continue to serve the needs of residents, including immigrant and low-income households. Historically the Mission has been a valuable source of affordable housing for immigrants and families. There are about 60,000 people living in the Mission district, about half of whom are foreign born, mostly from Central America and Mexico. Median household incomes are lower and household sizes about 30% larger in the Mission than the city as a whole, and this is particularly true for Latino households which, according to the 2000 census, have a median household size of 3.8 and a median household income of $44,500. For the entire Mission, the median household size is 3 and the median income is $48,227, whereas the citywide median household size is 2.3 and the median income is $55,200. Although new housing continues to be constructed in the Mission, the majority of this housing is market-rate, owner-occupied and generally unaffordable to existing residents and families. The production of affordable housing is one of the main goals of the Mission Area Plan, in order to provide housing for neighborhood residents and others who are overburdened by their housing costs. “Affordable housing” refers simply to apartments or condominiums that are priced so as not to financially burden a household – housing costs that do not prevent individuals or families of any income level from affording other necessities of life, such as food, clothing, transportation and medical care. While the City has established affordability limits for individuals and families earning anywhere from about 30% to about 120% of the city’s median income, even families beyond that threshold have difficulty affording housing in San Francisco. What constitutes an affordable rent or mortgage is more specifically defined locally as a proportion of annual income for individuals and families. Households are categorized by income as very low-, low-, and moderate-income households based on their relation to the median income. (Median income is the level at which exactly half of the City’s households are above and half are below.) According to the Mayor’s Office of Housing, the median income for 2007 for a household with four members in San Francisco was $80,319. Yet the substantial majority of market-rate homes for sale in San Francisco are priced out of the reach of low- and moderate-income households - less than 10% of households in the City can afford a median-priced home. The City’s Inclusionary Affordable Housing Program is one existing method by which the City produces several Below-Market-rate (BMR) units to families and individuals’ earning below what is required to afford market prices. Under the amended 2006 Ordinance, market-rate developments of five units or more are required to include a mandatory fifteen percent of the project’s total units as BMRs, which are affordable to low and moderate-income buyers (for rentals, people earning below 60 percent of median; for ownership units, people earning between 80 and 120 percent of median). Alternatively, developments may select an equivalent option of off-site development or payment of in-lieu fee. However, this program only covers those earning up to 120 percent of median income, which in 2007 was $96,400 for a household of four. Yet even families earning more than this have difficulty affording housing in San Francisco. Almost 30 percent of its households fall in the bracket of moderate and middle incomes. Housing for working households remains one of the City’s greatest needs. The Plan strives to construct new housing affordable to people with a wide range of incomes via the rezoning of some of the City’s industrial lands. It assists households at low- and very low-incomes through inclusionary and land dedication strategies. It aims to help people making above the 120% of median-income threshold for inclusionary housing but below the amount required to afford market-rate units, through “middle-income” development options. The Plan aims to lower the costs of housing production to translate into lower-priced units, by increasing development capacity, enabling cost-effective construction and by recognizing that “time is money” in reducing unnecessary processes. The City of San Francisco has produced a significant number of market-rate units in the last five years, yet still has many units to produce at low, moderate and middle incomes if it is to meet the spectrum of need identified in the Housing Element of the General Plan. San Francisco’s Housing Element establishes the Plan Area, as well as the entirety of the Eastern Neighborhoods, as a target area in which to develop new housing to meet San Francisco’s identified housing targets in the category of low-, moderate- and middle-income units. A portion of the industrial lands of the Eastern Neighborhoods – areas formerly zoned for C-M, M-1, and M-2 , but not required to meet current PDR needs - offer an opportunity to zone areas to meet these identified categories of need. Provide a high percentage of units affordable to very low-, low-, or moderate- income households on-site (through superinclusionary requirements, above and beyond the City’s Inclusionary Program) in a mixed-income project. Dedicate land for the development of 100% affordable housing, available to very low- and low-income households. Single Resident Occupancy (SRO) units – defined by the Planning Code as units consisting of no more than one room at a maximum of 350 square feet - represent an important source of affordable housing in the Mission, representing about 9% of its housing stock. (There are an estimated 457 SRO Hotels in San Francisco with over 20,000 residential units, with most located in the Mission, Tenderloin, Chinatown, and South of Market). SRO units have generally been considered part of the city’s stock of affordable housing, and as such, City law prohibits conversion of SROs to tourist hotels. SROs serve as an affordable housing option for elderly, disabled, and single-person households, and in recognition of this, the Plan adopts several new policies to make sure they remain a source of continued affordability. Therefore, SROs are permitted as a category of housing available to moderate, middle-income and low income households.. In recognition of the fact that SROs serve small households, the Plan exempts SRO developments from meeting unit-mix requirements. In recognition of the fact that SROs truly are living spaces, and to prevent the kind of substandard living environments that can result from reduced rear yards and open spaces, this Plan requires that SROs adhere to the same rear yard and exposure requirements as other types of residential uses. Finally, the Plan calls for sale and rental prices of SROs to be monitored regularly to ensure that SROs truly remain a source of affordable housing, and that policies promoting them should continue. Require developers in some formally industrial areas to contribute towards the City’s very low-, low-, moderate- and middle-income needs as identified in the Housing Element of the General Plan. Provide land and funding for the construction of new housing affordable to very low- and low-income households. Provide units that are affordable to households at moderate and “middle incomes” – working households earning above traditional below-market-rate thresholds but still well below what is needed to buy a market-priced home, with restrictions to ensure affordability continues. The existing housing stock is the City’s major source of relatively affordable housing. The Eastern Neighborhoods’ older and rent-controlled housing has been a long-standing resource for the City’s lower and middle income families. Priority should be given to the retention of existing units as a primary means to provide affordable housing. Demolition of sound existing housing should be limited, as residential demolitions and conversions can result in the loss of affordable housing. The General Plan discourages residential demolitions, except where they would result in replacement housing equal to or exceeding that which is to be demolished. The Planning Code and Commission already maintain policies that generally require conditional use authorization or discretionary review wherever demolition is proposed. In the Eastern Neighborhoods, policies should continue requirements for review of demolition of multi-unit buildings. A permit to demolish a residence cannot be issued until the replacement structure is approved. When approving such a demolition permit and the subsequent replacement structure, the Commission should review levels of affordability and tenure type (e.g. rental or for-sale) of the units being lost, and seek replacement projects whose units replaced meet a parallel need within the City. The goal of any change in existing housing stock should be to ensure that the net addition of new housing to the area offsets the loss of affordable housing by requiring the replacement of existing housing units at equivalent prices. The rehabilitation and maintenance of the housing stock is also a cost-effective and efficient means of insuring a safe, decent housing stock. A number of cities have addressed this issue through housing rehabilitation programs that restore and stabilize units already occupied by low-income households. While the City does have programs to finance housing rehabilitation costs for low-income homeowners, it could expand this program to reach large-scale, multi-unit buildings. Throughout the project area, the City could work to acquire and renovate existing low-cost housing, to ensure its long-term affordability. According to the Eastern Neighborhoods Socioeconomic Rezoning Impacts analysis, the Mission has a high concentration of family households relative to the rest of the city and even to other areas in the Eastern Neighborhoods. Close to 50 percent of all households in the Mission are family households, over 22 percent are households with children, and just fewer than 20 percent of the total population in the Mission are children under 18 years of age. Household size also tends to be greater in the Mission, with households with four or more people constituting a large percentage – 20 percent of households – while the share of housing units with one bedroom or no bedrooms is above 50 percent of all units in the area. Therefore, the Mission, which claims more than half of the Eastern Neighborhoods housing stock, shows the greatest mismatch between housing type and housing need. Overcrowding, defined by the U.S. Census bureau as more than one person per room, and severe overcrowding (more than 1.5 persons per room) is also greatest - over 6 percent overcrowded and 15 percent severe - in the Mission. The need for housing in the Mission covers the full range of tenure type (ownership versus rental) and unit mix (small versus large units). While there is a market for housing at a range of unit types, recent housing construction has focused on the production of smaller, ownership units. Policies in this plan are aimed to correcting this imbalance, in order to better serve families and renters. The Housing Element of the city’s General Plan recognizes that rental housing is often more affordable than for-sale housing, and existing city policies regulate the demolition and conversion of rental housing to other forms of occupancy. New development in the Mission area should ensure that rental opportunity is available for new residents as well. To try to achieve more family friendly housing, the Plan makes several recommendations. New development will be required to include a significant percentage of units with two or more bedrooms (SROs and senior housing will be exempted from this requirement). Family-friendly design should incorporate design elements such as housing with private entrances, on-site open space at grade and accessible from the unit, inclusion of other play spaces such as wide, safe sidewalks, on-site amenities such as children’s recreation rooms or day-care. The Planning Department can also encourage family units by drafting family-friendly guidelines to guide its construction, and by promoting projects which include multi-bedroom housing located in close proximity to schools, day-care centers, parks and neighborhood retail. Projects that met such guidelines could be provided faster processing time, including streamlined processing. One of the key priorities of the Mayor’s Office of Housing is expanding the stock of family, rental housing, with particular emphasis on very low and extremely low-income families. The Plan encourages the Mayor’s Office to maintain this priority in funding 100% affordable housing developments that provide safe, secure housing with multiple bedrooms and family-oriented amenities such as play areas and low-cost child care. In addition to the type of housing constructed, it is important to consider the services and amenities available to residents – transit, parks, child care, library services, and other community facilities. Many parts of the Eastern Neighborhoods are already underserved in many of these categories; and the lower income, family-oriented households of these neighborhoods, more than any other demographic, have a need for these services. The Plan aims to improve the neighborhoods, and to meet the needs that new residential units in the Eastern Neighborhoods will create, including increased demands on the area’s street network, limited open spaces, community facilities and services. New development will be required to contribute towards improvements that mitigate their impacts. The resulting community infrastructure, constructed through these funds and through other public funding, will benefit all residents in the area. Require that a significant number of units in new developments have two or more bedrooms, except Senior Housing and SRO developments unless all Below Market Rate units are two or more bedrooms. Encourage the creation of family supportive services, such as childcare facilities, parks and recreation, or other facilities, in affordable housing or mixed-use developments. Explore a range of revenue-generating tools including impact fees, public funds and grants, assessment districts, and other private funding sources, to fund community and neighborhood improvements. There are a number of design and construction techniques that can make housing “affordable by design” – efficiently designed, less costly to construct, and therefore less costly to rent or purchase. For example, forgoing structured parking can significantly reduce construction costs. Thus, as part of this Plan, parking requirements will be revised to allow, but not require parking. This provision will allow developers to build a reasonable amount of parking if desired and if feasible while meeting the Plan’s built form guidelines. Small infill projects, senior housing projects or other projects that may desire to provide fewer parking spaces would have the flexibility to do so. Also, conventionally framed low-rise construction is less costly than high-rise construction requiring steel and concrete. City actions including modifying zoning and building code requirements to enable less costly construction, as well as encouraging smaller room sizes and units that include fewer amenities or have low-cost finishes while not yielding on design and quality requirements can facilitate these techniques. Finally, the approval process for housing can be simplified, to reduce costs associated with long, protracted approval periods. Discretionary processes such as Conditional Use authorizations, and mandatory (i.e. non community initiated) Discretionary Review, should be limited as much as possible while still ensuring adequate community review. Provisions within CEQA should be used to enable exemptions or reduced review, including reduced traffic analysis requirement for urban infill residential projects. Revise residential parking requirements so that structured or off-street parking is permitted up to specified maximum amounts in certain districts, but it is not required. To promote health at the neighborhood level, the San Francisco Department of Public Health has facilitated the multi-stakeholder Eastern Neighborhoods Community Health Impact Assessment (ENCHIA) to produce a vision for a healthy San Francisco as well as health objectives, measures, and indicators. The Department of Public Health (DPH) has worked with the Planning Department and other city agencies to assess the impacts, both positive and negative, of new development, and many aspects of this plan reflect those efforts. In addition, there are a number of Citywide policies that can be modified to recognize population needs and growth. Units that are nonconforming or illegal, such as accessory units or housing in nonresidential structures, are often sources of affordable housing, and the City should continue to explore ways of legalizing such units. One prime example is live-work units, which as nonconforming units are limited in expansion. The City could enable live/work units to conforming status as a residential unit, provided they meet planning and building code requirements for residential space and pay retroactive residential development fees, e.g. school fees, as well as new impact fees that are proposed as part of this area plan. Finally, the City should work outside of the planning process to support affordable housing through citywide initiatives, such as housing redevelopment programs, and employer subsidies for workforce housing. The many cultures, land uses, architectural styles, street grids and street types that exist within the Mission neighborhood define its character and set it apart from other areas of San Francisco. Indeed it is the coexistence and commingling, at times chaotic, of all these different elements that attracts most residents to the Mission. Urban design is central to defining how such a diverse physical and social environment is able to function, and will determine whether new additions contribute to, or detract from, the neighborhood’s essential character. The main purpose of this chapter is to strengthen the current character of the neighborhood, while allowing new development to positively contribute in an original way to the quality of life of residents, visitors and workers. The three main elements addressed here are height, architectural design and the role of new development in supporting a more ecologically sustainable urban environment. The policies and guidelines in this chapter will help to harmonize the old and the new. Where it is appropriate from an urban design and city building perspective, increase heights in those areas that are expected to see significant new development or that ought to have increased heights to support the city’s public transit infrastructure. The design of streets and sidewalks, an equally critical element in creating sustainable and enjoyable neighborhoods, is addressed in the Street and Open Space chapter of this Plan. The Mission is one of the city’s most distinctive neighborhoods. To maintain this unique character in the face of new development we must ensure that buildings are of high-quality design and that they relate well to historic and surrounding structures. We must also ensure that new buildings enhance the quality of place and that ensure the neighborhood’s long-term livability and a compelling relationship to the rest of the city. Adopt heights that are appropriate for the Mission’s location in the city, the prevailing street and block pattern, and the anticipated land uses, while preserving the character of its neighborhood enclaves. The design of new, mixed-use infill development in the Northeast Mission Industrial Zone (NEMIZ) should strengthen the area’s industrial character through appropriate materials, massing, and setback. The tight integration of light industrial, mixed-use and residential buildings makes the NEMIZ a unique area in the city. All new development needs to strengthen the area’s traditional industrial character by choosing quality materials and finishes compatible with the existing fabric and by designing within a building envelope that is consistent with the surrounding context. New development should also recognize the building’s responsibility to provide architecturally interesting ground floors that contribute to, and not detract from, the pedestrian experience. Generally, the height of buildings is set to relate to street widths throughout the Plan Area. An important urban design tool in specific applications is to frame streets with buildings or cornice lines that roughly reflect the street’s width. A core goal of the height districts is to create an urban form that will be intimate for the pedestrian, while improving opportunities for cost-effective housing and allowing for pedestrian-supportive ground floors. Heights should also reflect the importance of key streets in the city’s overall urban pattern, such as Mission and Valencia streets, while respecting the lower scale development that typifies much of the established residential areas throughout the Plan Area. Generally, the prevailing height of buildings is set to relate to street widths throughout the Plan Area. Height should also be used to emphasize key transit corridors and important activity centers. A primary intent of the height districts is to provide greater variety in scale and character while maximizing efficient building forms and enabling gracious ground floors. Respect public view corridors. Of particular interest are the east-west views to the Twin Peaks and Potrero Hill, south views to Bernal Hill, and several views towards the downtown. Important historic buildings cannot be replaced if destroyed. Their rich palette of materials and architectural styles imparts a unique identity to a neighborhood and provides valuable additions to the public realm. The Mission, as do the other inner-ring neighborhoods with an industrial past, demonstrates how adaptive reuse of historic buildings can provide a unique, identifiable, and highly enjoyed public place. Historic or otherwise notable buildings and districts should be celebrated, preserved in place, and not degraded in quality. 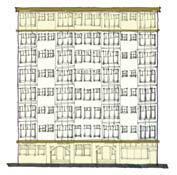 See the Historic Preservation section of this area plan for specific preservation policies. Establish and require height limits along alleyways to create the intimate feeling of an urban room. Introducing through-alleys is an important part of a dynamic pedestrian network along otherwise large blocks. The alleyway network in the Mission offers residents and visitors the opportunity to walk through one of the most intimately-scaled environments in San Francisco. This feeling of intimacy is established by carefully balancing building height and setbacks so as to ensure a sense of enclosure, while not overwhelming the senses. Heights at the property line along both sides of alleys should be limited. In general, building height at the property line must not exceed 1.25 times the width of the alley. Above this height, a minimum 10-foot setback is required to maintain the appropriate and desired scale. Establish and require height limits and upper story setbacks to maintain adequate light and air to sidewalks and frontages along alleys. The narrowness of many of the Mission’s alleyways requires that development along them be carefully sculpted to proper proportions and to ensure that adequate light and air reach them and the frontages along them. 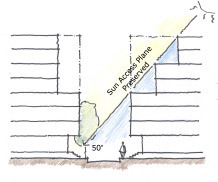 In addition to the building height and setback requirements stated in Policy 3.1.10 above, the building height at the property line along the south side of east-west alleys, building height must be setback so as to ensure a 45-degree sun access plane, as extended from the property line on the opposite side of the street to the top corner of each story. Along both north-south and east-west alleyways, setbacks are not required for the first 60 linear feet of the alley from the adjoining major street, as measured from the property line along the major street, so as to allow a proper streetwall along that street. Architectural design should be used to highlight publicly important views generated by shifts in the street grid or the termination of a street at a T-intersection. The evolution of the city’s built fabric presents important opportunities to increase visual interest and create a special identity for the neighborhood. As one moves through the neighborhood, unexpectedly coming upon a view that terminates in a building designed to a higher standard generates an image unique to that place, while also helping to create a special connection to the built environment. 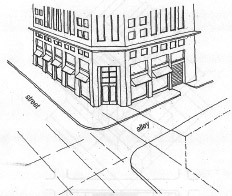 G. Extended blank or blind frontages are not permitted along Transit Preferential Streets as defined in the General Plan, and within the 6th Street neighborhood commercial transit district, even if alternative street or alley frontage is not available. A. Maximize interior clear ceiling heights for ground floor retail or PDR uses. Where height districts end in five feet, such as 45’, 55’, 65’, and 85’, interior ground floor clear ceiling heights should maximize a fifteen foot envelope. This additional height will increase the flexibility of the space and improve its long-term viability. At-grade parking must be wrapped with at least 15 feet of active uses, such as retail or PDR. Parking infrastructure should not be noticeable from the street. The above building shows how insubstantial materials and observable parking infrastructure can degrade the pedestrian experience on the street. G. Curb cuts are prohibited on Transit Priority Streets (TPS), along Valencia Street, and on 24th Street through the neighborhood retail district, even if alternative street or alley frontage is not available. E. Utility vaults and access panels should be placed in driveway curb cuts so as to prevent blank building frontages and to ensure that sidewalk planting opportunities for street trees and landscaping are not limited. B. Major entrances should be located at corners, but primary residential entrances can be located away from the corner to prevent congestion. C. Architectural features and detailing including towers, bays, and copulas at the corner are strongly encouraged. In dense neighborhoods such as the Mission, streets can provide important and valued additions to the open space network, offering pleasurable and enjoyable connections for people between larger open spaces. Maintaining a pleasurable pedestrian environment along the street is an important element of the plan. A. Developments on properties with 200 or more feet of street frontage on a block face longer than 400 feet should provide a minimum 20-foot-wide publicly accessible mid-block right of way and access easement for the entire depth of the property, connecting to existing streets or alleys. C. Developments on properties with 100 feet or more, but less than 200 feet of street frontage in the middle one-third of a block face longer than 400 feet where the adjacent property has the potential to do likewise, should be encouraged to provide a minimum 10-foot-wide publicly accessible mid-block right of way and access easement for the entire depth of the property, connecting to existing streets or alleys. Recognize the distinctive Mission murals and expand the opportunities for new murals as well as other public art by providing space such as visible and publicly accessible walls in new construction adjacent to or near the murals to allow for these art traditions to thrive and continue, and by ensuring new construction does not obstruct, demolish, damage or otherwise diminish the Mission murals and other public art. Preserve sunlight access to BART plazas. Require new development to adhere to a new performance-based ecological evaluation tool to improve the amount and quality of green landscaping. The San Francisco Planning Department, in consultation with the Public Utilities Commission, is in the process of developing a green factor. The green factor will be a performance-based planning tool that requires all new development to meet a defined standard for on-site water infiltration, and offers developers substantial flexibility in meeting the standard. A similar green factor has been implemented in Seattle, WA, as well as in numerous European cities, and has proven to be a cost-effective tool, both to strengthen the environmental sustainability of each site, and to improve the aesthetic quality of the neighborhood. The Planning Department will provide a worksheet to calculate a proposed development’s green factor score. These simulations show how much more streets can be than just places for through traffic. With reclaimed space for people to sit or eat, or as attractive green connectors, streets can become vital elements of a neighborhood for all users. The Mission District’s compact built environment and its varied mix of uses make walking, bicycling and public transit attractive, high-demand transportation modes. Abundant transit options (local and regional), vibrant, pedestrian-scale commercial corridors (Mission Street, Valencia Street and 24th Street) and a popular network of bicycle lanes and routes make the Mission a great neighborhood to get around in without a car. The vision for an improved transportation system within the Mission District includes improvements for all modes, especially pedestrians and transit. Efforts to improve transit speed, reliability and the safety of pedestrians and bicyclists should not obstruct the loading and circulation needs of vehicles supporting the Mission’s PDR business activities. The Mission’s several Muni lines and two BART stations make it an important local and regional transit hub. Commuters, residents and visitors from San Francisco and throughout the Bay Area pour in and out of the BART Stations at both 16th Street and 24th Street each morning and evening. Muni’s 14 and 49 buses which run along Mission Street carry almost 40,000 riders every day. The 48, 22, 33, and 9 bus lines also serve the Plan Area. Enhancements to existing transit service that improve speed and reliability should be made to reinforce the neighborhood’s existing transit orientation. Mission Street, 16th Street and Potrero Avenue stand out as desirable corridors to be considered for high-level transit improvements. These streets are called out in the San Francisco Municipal Transportation Agency’s (SFMTA) A Vision for Rapid Transit in San Francisco (2002) as corridors important to long-range transit planning. New bus rapid transit (BRT) service, transit signal priority, transit-only lanes, and/or lengthened distances between stops are some tools that should be explored further. The role of 16th Street as a key east-west transit corridor continues to grow as new development in the Eastern Neighborhoods and Mission Bay takes shape. Sixteenth Street is the only street that provides a continuous uninterrupted connection between the Mission, Showplace Square, Mission Bay and the eastern waterfront. It is also provides a critical link between local (Muni Third Street Light Rail) and regional transit (16th Street BART). The planned rerouting of the #22 bus down the full length of 16th Street to Mission Bay will help establish a major cross-town route in this developing area. Transit improvements for the 16th Street corridor are needed to accommodate increased transit service and to ensure transit vehicles are not crippled by congestion. Collaborative planning between city agencies, BART, businesses and large land holders like UCSF is necessary to design a transit corridor that prioritizes transit while serving the diverse land uses along the corridor. Transit improvements on 16th Street will also benefit the existing PDR businesses and employees found in the area that are expected to stay and grow. Beginning in 2008, the SFMTA, Planning Department and the San Francisco County Transportation Authority (SFCTA) will commence a comprehensive Eastern Neighborhoods Transportation Implementation Planning Study (EN TRIPS) to further explore the feasibility of the options described above, determine which projects are needed, how they should be designed and how they can be funded. A key input to this will be SFMTA’s “Transit Effectiveness Project” (TEP), the first comprehensive study of the Muni system since the late 1970s. The TEP aims to promote overall performance and long-term financial stability through faster, more reliable transportation choices and cost-effective operating practices The TEP recommendations focus on improving transit service, speed and reliability and should be implemented as soon as possible within the Mission area. Commit resources to an analysis of the street grid, the transportation impacts of new zoning, and mobility needs in the Mission / Eastern Neighborhoods to develop a plan that prioritizes transit while addressing needs of all modes (transit, vehicle traffic, bicyclists, pedestrians). Reduce existing curb cuts where possible and restrict new curb cuts to prevent vehicular conflicts with transit on important transit and neighborhood commercial streets. Curb cuts should be reduced on key neighborhood commercial, pedestrian, and transit streets, where it is important to maintain continuous active ground floor activity, reduce transit delay and variability, and protect pedestrian movement and retail viability such as Mission, Valencia, 16th and 24th Streets. This is critical measure to reduce congestion and conflicts with pedestrian and transit movement along Transit Preferential Streets, particularly where transit vehicles do not run in protected dedicated rights-of-way and are vulnerable to disruption and delay. Enhance existing public transit service linking the Mission to downtown and BART. Balance competing land use and transportation-related priorities for 16th Street in the Mission to improve transit speed and reliability. As a core PDR area served by a major transit route (Muni’s #22 bus), 16th Street and neighboring parcels illustrate the conflicts between the competing policy goals of improving transit and preserving PDR businesses. PDR land uses in the Mission and Showplace Square should be preserved to support the critical business activity they provide. However, PDR-related truck traffic, loading and circulation needs can slow transit vehicles. Further planning and design work is needed to make 16th Street a better transit street by mitigating the impacts of surrounding land uses. For example, off-street truck loading requirements and transit-signal priority can improve 16th Street for transit while continuing to support the neighboring PDR land uses. Study the possibility of creating a “premium” transit service such as Bus Rapid Transit or implementing high-level transit preferential treatments for segments of Mission Street, 16th Street and Potrero Avenue. A transit rider’s experience is largely impacted by the quality of environment in and around the stops and stations where they start or end their transit trips. Transit stops can be made more attractive and comfortable for riders through installation of bus bulbs, shelters, additional seating, lighting, and landscaping. Pedestrian safety should also be prioritized near transit through the installation and maintenance of signs, crosswalks, pedestrian signals and other appropriate measures. Quality passenger information such as maps directing riders to major destinations, and accurate real-time transit information should be provided. Key transit stops with high passenger volumes or where transfers occur should be prioritized for enhanced amenities. In the Mission, these key stops may include 16th Street and Mission, 24th Street and Mission, 16th street and Potrero Avenue among others. The Mission’s dense concentration of housing along with its vibrant mix of restaurants, neighborhood services, shopping and nightlife all generate a high demand for parking. Determining how existing and new parking is managed in the Mission is essential to achieving a range of community goals including reduced congestion and private vehicle trips, improved transit, successful commercial areas, housing production and affordability, and attractive urban design. “Unbundling” parking from housing costs can reduce the cost of housing and make it more affordable to people without automobiles. The cost of parking is often aggregated in rents and purchase prices. This forces people to pay for parking without choice and without consideration of need or the many alternatives to driving available in the Mission. This could be avoided by requiring that parking be separated from residential or commercial rents, allowing people to make conscious decisions about parking and auto ownership. In accordance with Section 8A.113 of Proposition E (2000), new public parking facilities can only be constructed if the revenue earned from a new parking garage will be sufficient to cover construction and operating costs without the need for a subsidy. New development built with reduced parking could accommodate parking needs of drivers through innovative shared parking arrangements like a “community parking garage.” Located outside of neighborhood commercial and small scale residential areas, such a facility would consolidate parking amongst a range of users (commercial and residential) while contributing to the neighborhood with an active ground floor featuring opportunities for neighborhood services and retail. Make the cost of parking visible to users, by requiring parking to be rented, leased or sold separately from residential and commercial space for all new major development. Permit construction of new parking garages in Mixed Use districts only if they are part of shared parking arrangements that efficiently use space, are appropriately designed, and reduce the overall need for off-street parking in the area. A significant share of deliveries to PDR and other businesses in the Mission are performed within the street space. Where curbside freight loading space is not available, delivery vehicles double-park, blocking major thoroughfares like Mission Street, slowing transit and creating potential hazards for pedestrians, bicyclists and automobiles. The City should evaluate the existing on-street curb-designation for delivery vehicles and improve daytime enforcement to increase turnover. Where necessary, curbside freight loading spaces should be increased. During evenings and weekends, curbside freight loading spaces should be made available for visitor and customer parking. In new non-residential developments, adequate loading spaces internal to the development should be required to minimize conflicts with other street users like pedestrians, bicyclists and transit vehicles. Provide an adequate amount of short-term, on-street curbside freight loading spaces in PDR areas of the Mission. In areas with a significant number of PDR establishments, design streets to serve the needs and access requirements of trucks while maintaining a safe pedestrian environment. Not only are streets essential for movement, but they are a major component of the city’s public realm and open space network. The Mission’s streets and sidewalks move people and goods as well as provide places to sit, talk and stroll. Past sale of streets or rights-of-way to accommodate private development has impeded connectivity and mobility in some parts of San Francisco. Future closure and sale of city streets to private development should be discouraged unless it is determined excess roadway or reconfiguration of specific intersection geometries will achieve significant public benefits such as increased traffic safety, pedestrian safety, more reliable transit service or public open space. New developments on large lots must consider alleys to break up the scale of the building and allow greater street connectivity. The Mission’s primary commercial corridors - Mission, Valencia and 24th Streets – are crowded with pedestrians. Storefront retail, street level art and murals, good transit, well-marked crosswalks, and pedestrian signals all support a strong walking environment. However, conflicts with vehicles continue to present pedestrian safety concerns in the neighborhood. Opportunities exist to further improve pedestrian safety and accessibility in the Mission. Several studies related to pedestrian improvements in the Mission have been completed or are in the planning stages. Recommendations from the Southeast Mission Pedestrian Safety Plan produced by SFMTA and the Department of Public Health should be implemented. In addition, the Planning Department is working with the SFMTA to develop the Mission Public Realm Plan and Better Streets Plan to ensure the Mission’s streets are designed to promote pedestrian comfort and safety. The planned widening of Valencia Street’s sidewalks should also be seen through to completion. In 2008, the Planning Department will be leading a planning process for the redesign of Cesar Chavez Street to make the street function better for pedestrians, bicyclists and transit. Where possible, the city should implement high-visibility crosswalks, pedestrian signal heads with countdown timers, corner bulbouts, median refuge islands, or other pedestrian improvements. In specific areas with known higher rates of pedestrian-collisions, developers should be encouraged to carry out context specific planning and design on building projects to improve pedestrian safety. Implement recommendations from the Mission Public Realm Plan, Southeast Mission Pedestrian Safety Plan and established street design standards and guidelines to make the pedestrian environment safer and more comfortable for walk trips. Improve pedestrian access to major transit stops and stations such as the 16th and 24th Street BART Stations. The Mission’s existing bicycle infrastructure and relatively flat terrain create an attractive bicycling environment. The Valencia and Harrison Street bicycle lanes are busy with bicyclists during commute times and throughout the day. These lanes provide good north-south bicycle connections, but the Mission lacks strong east-west bicycle facilities. Improvements are planned to strengthen east-west connections. The SFMTA currently has improvements planned for Cesar Chavez and 17th Streets. Bicycle lanes and shared lane markings (“sharrows”) on select segments of these streets will be installed once the San Francisco Bicycle Plan achieves environmental clearance. In addition, increased bicycle parking throughout the Mission especially in commercial areas and near BART is needed to accommodate the ever increasing number of bicyclists. 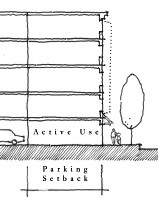 Recent citywide zoning code amendments require bicycle parking for all new developments. The proposed Mission Creek Bikeway presents the opportunity for a future landscaped bicycle path from the Mission District to Mission Bay. Bikeway plans should be further examined, especially issues surrounding cost and implementation. Provide a continuous network of safe, convenient and attractive bicycle facilities connecting the Mission to the citywide bicycle network and conforming to the San Francisco Bicycle Plan. Carsharing offers an affordable alternative to car ownership by allowing individuals the use of a car without the cost of ownership (gas, insurance, maintenance). Carsharing companies provide privately owned and maintained vehicles for short-term use by their members. Carshare members pay a flat hourly rate or monthly fee to use cars only when they need them (i.e. to run errands or make short trips). The Mission already has a high concentration of car share vehicles, especially near the Mission and Valencia corridors. Recent zoning code changes require carshare spaces in new residential developments. Car sharing should continue to be encouraged in the Mission as part of new residential and commercial developments in support of parking policies and increased mobility of residents without automobiles. “Transportation demand management” (TDM) programs that encourage residents and employees to walk, bike, take public transit or rideshare should be implemented in the Mission and throughout the Eastern Neighborhoods. Transportation Demand Management (TDM) combines marketing and incentive programs to reduce dependence on automobiles and encourage use of a range of transportation options. Cash-out policies (where employers provide cash instead of a free parking space), Commuter Checks and emergency ride home programs are some of the methods institutions and employers can utilize. City College of San Francisco’s new Valencia Street campus, among other large institutions and employers should be encouraged to develop programs that provide information and incentives to students and staff related to the many transportation alternatives nearby. Major residential developments (50+ units) should be required to provide transit passes to all residents as part of rent or homeowner association fees. Automobiles in the Mission navigate streets crowded with pedestrians, bicyclists and transit vehicles. Vehicle traffic should be accommodated without jeopardizing the safety of other street users. Traffic calming projects should be implemented to reduce speeding and improve safety, without introducing delay or reliability problems for transit. Guerrero Street and South Van Ness Avenue provide opportunities for traffic calming to balance neighborhood and pedestrian needs with auto traffic. Decrease auto congestion through implementation of Intelligent Traffic Management Systems (ITMS) strategies such as progressive metering of traffic signals and the SFMTA “SFGO” program. New development in the Mission and throughout the Eastern Neighborhoods will exert significant strain on the area’s existing transportation infrastructure. The City must develop new funding sources and a funding plan to ensure needed improvements are made. Transportation improvements are costly. While federal, state, regional and local grant sources are available to partially defray the cost of transportation capital projects, they are not sufficient to meet transportation needs identified by the community. Streets and transportation improvements (pedestrian, bicycle, and transit) will require a significant portion of the funding generated through the Eastern Neighborhoods Public Benefits Program. Because funds from this program will also be needed to support a number of other community improvements beside transportation, it will be important to identify additional sources of funding. As part of the Eastern Neighborhoods Public Benefits Program, pursue funding for transit, pedestrian, bicycle and auto improvements through developer impact fees, in-kind contributions, community facilities districts, dedication of tax revenues, and state or federal grant sources. The Mission has a deficiency of open spaces serving the neighborhood. Some portions of the Mission historically have been predominantly industrial, which has meant that many areas are not within walking distance to an existing park and many areas lack adequate places to recreate and relax. Moreover, the Mission has a concentration of family households with children -- almost 50% -- which is significantly higher than most neighborhoods in the city. With the addition of new residents, this deficiency will only be exacerbated. Thus, one of the primary objectives of this Plan is to provide more open space to serve both existing and new residents, workers and visitors. Analysis reveals that a total of about 4.3 acres of new space should be provided in this area to accommodate expected growth. This Plan proposes to provide this new open space by creating at least one substantial new park site in the Mission. In addition, the Plan proposes to encourage some of the private open space that will be required as part of development to be provided as public open space and to utilize our existing rights-of-way to provide pocket parks. In a built-out neighborhood such as this, finding sites for sizeable new parks is difficult. However, it is critical that at least one new substantial open space be provided as part of this Plan. The Planning Department will continue working with the Recreation and Parks Department to identify a site in the Mission for a public park and will continue to work to acquire additional open spaces. In order to provide this new open space, significant funding will need to be identified to acquire, develop, and maintain the space. One source of funds would be impact fees or direct contributions from new development. New residential development directly impacts the existing park sites with its influx of new residents, therefore new residential development will be required to either pay directly into a fund to acquire new open space. Commercial development also directly impacts existing park sites, with workers, shoppers and others needing places to eat lunch and take a break outside. Existing requirements in the Mission for commercial development establish a minimum amount of open space to be provided on-site, or project sponsors may elect to pay an in-lieu fee. Because these fees are low, project sponsors often elect to pay the fee. This Plan proposes to maintain the current requirements for commercial development to provide adequate, usable open space, but increase the in-lieu fee if project sponsors choose not to provide this space. This in-lieu fee will be used to provide publicly accessible open space. Identify opportunities to create new public parks and open spaces and provide at least one new public park or open space serving the Mission. Require new residential and commercial development to contribute to the creation of public open space. In addition to the publicly accessible open space requirements, another tool for making the Mission greener is to require additional private open space. Currently, residential developments are required to provide open space accessible to residents. Because of its more industrial past, this requirement is currently much lower in the Northeast Mission than other parts of the Mission. This Plan increases the open space required as part of new developments to be similar to what is currently required in other neighborhoods that allow residential redevelopment. Additionally, commercial development is currently required to provide open space in SoMa. These existing requirements establish a minimum amount of open space to be provided on-site, or project sponsors may elect to pay an in-lieu fee. Because these fees are low, project sponsors often elect to pay the fee. This plan proposes to reexamine the current requirements for commercial development in SoMa to provide adequate, usable open space, and it proposes to expand them and apply them to projects in the Mission. In small-scale residential developments in this area, open space is provided as backyards. Currently many of the blocks, especially the alleys and neighborhood commercial streets of Mission and Valencia, have a rear yard pattern similar to many of the residential neighborhoods in the city. Taken together in the center of a block, these rear yards provide a sense of visual relief and access to open space in this part of the city. In areas where the existing pattern is one of rear yards, this pattern should be maintained. However, in areas where rear yards do not predominate, new residential developments should provide open space in a manner that best fits the characteristics of the particular site, while still ensuring high quality open space design. The quality of the private open space is also being reexamined in the Mission District. Currently, open space is often provided as sterile hardscape atop a building’s podium. By employing the new performance-based evaluation tool, discussed in greater detail in the Built Form section of this Area Plan, required open space will be made greener, more ecologically sustainable, and more enjoyable for residents. Require new residential and mixed-use residential development to provide on-site, private open space designed to meet the needs of residents. New development should respect existing patterns of rear yard open space. Where an existing pattern of rear yard open space does not exist, new development on mixed-use-zoned parcels has flexibility as to where open space can be located. Ensure quality open space is provided in flexible and creative ways, adding a well used, well-cared for amenity for residents of a highly urbanized neighborhood. Private open space should meet the following design guidelines: A. Designed to allow for a diversity of uses, including elements for children, as appropriate. B. Maximize sunlight exposure and protection from wind C. Adhere to the performance-based evaluation tool. In new mixed-use developments, common, unenclosed residential open space areas can be provided as a rear yard, rooftop garden, central courtyard, balcony, or elsewhere on the lot or within the development so long as it is clearly accessible and usable by residents. Landscaping visible from the street is encouraged. Common spaces are encouraged over private spaces. CREATE A NETWORK OF GREEN STREETS THAT CONNECTS OPEN SPACES AND Improves THE WALKABILITY, AESTHETICS and ecological sustainability OF THE NEIGHBORHOOD. In a built out neighborhood such as the Mission, acquiring sites for new large parks can be difficult. For this reason, in addition to the acquisition of at least one park site in the neighborhood, the Mission Area Plan proposes an open space network of “Green Connector” streets, with wider sidewalks, places to sit and enjoy, significant landscaping and gracious street trees that would provide linkages between larger open spaces and diffuse the recreational and aesthetic benefits of these spaces into the neighborhood. Green Connector streets are proposed throughout the Mission to connect the Mission east to Potrero Hill and eventually the Bay as well as west to Dolores Park and Noe Valley. Although the specific locations will be addressed in the upcoming Mission Public Realm Plan, connections are desirable in the northern part of the Mission (e.g. 16th or 17th Streets), in the center of the Mission (e.g. 20th or 21st Streets) and through the southern part of the Mission (e.g. 24th, 25th or Cesar Chavez Streets). Additionally, north-south connections are being considered for Potrero Avenue (See Map 5 - Eastern Neighborhoods Streets and Open Space Concept Map). Reconfiguring many of the Mission’s wide, heavily trafficked streets that currently satisfy the needs of private vehicles over the needs of pedestrians and cyclists would go far to create a more livable neighborhood for residents, workers, and visitors. The Mission Area Plan calls for a fundamental rethinking of how the city designs and uses its streets. In addition to Green Connector streets, smaller streets and alleys can provide a welcomed respite from the busy activities along major streets. These alleyways are proposed to be converted into “living streets,” where through-traffic is calmed and paving and landscaping are designed to reflect what is envisioned as the pedestrian primacy of these streets. (See Map 5 - Eastern Neighborhoods Streets and Open Space Concept Map). In dense neighborhoods such as the Mission District, it is increasingly clear that streets can and should provide important and valued additions to the open space network and aesthetic quality of the area. The design and maintenance of all other streets throughout the Plan Area should be guided by the forthcoming Better Streets Plan, a policy document that will provide direction on how to improve the overall urban design quality, aesthetic character, and ecological function of the city’s streets while maintaining safe and efficient use for all modes of transportation. The Better Streets Plan will provide guidance for both public and private improvements to the streetscape. The Mission Area Plan, in addition to the Better Streets Plan, will generate amendments to the Planning Code to make more explicit the requirements of private developers to construct and maintain a more enjoyable, more beautiful pedestrian environment. In addition to these general streetscape improvements along streets, specific design interventions should also be considered for major intersections. To better foster a sense of place and to improve the pedestrian experience, at important intersections, significant public space improvements - such as bulb-outs and landscaping treatments - should be focused at these intersections. Additionally, as described in the Built Form chapter of this Plan, specific effort should be paid to improving the quality, design, massing, and scale of corner buildings to better reflect the civic importance of major street intersections. The Mission Area Plan also calls for two primary interventions that are aimed at connecting the Mission’s open space network to that of the city as a whole. The first is a Civic Boulevard such as Folsom Street, connecting the emerging Transbay and Rincon Hill Areas, East and West SoMa, and the Mission District. A Civic Boulevard would be a green street linking public open spaces, cultural and social destinations, and transit connections. It would be heavily landscaped with a strong design aesthetic, with pocket parks, plazas, and with wide sidewalks and a distinctive lighting character. Through the Mission, Folsom street is a more residential in character than in SoMa and the improvements proposed would reflect this more residential character. Second, primary pedestrian connections between neighborhoods are to be strengthened. Sixteenth, 24th, Mission, and Valencia Streets are currently designated pedestrian connectors between the Mission, SoMa, Upper Market, and the Castro. Potrero and South Van Ness should be added to this street classification. Primary pedestrian streets should aim to foster an enjoyable pedestrian environment, such as minimizing shade, maximizing sidewalk width, and providing agreeable pedestrian amenities such as lighting and street furniture. The forthcoming Mission Public Realm plan will focus in detail on the Mission District’s streets and public spaces. This Plan will define how best to define the street typologies found in the Mission, with the goals of reducing private vehicle primacy, fostering walking, and strengthening economic vitality of neighborhood commercial streets. The Mission Public Realm Plan will serve as the implementing document for the streetscape improvements proposed in this Area Plan. Significant above grade infrastructure, such as freeways should be retrofitted with architectural lighting to foster pedestrian connections beneath. Develop a comprehensive public realm plan for the Mission that reflects the differing needs of streets based upon their predominant land use, role in the transportation network, and building scale. Ecological sustainability is also a key goal in the development of public spaces. Some new public spaces will be created through the reclamation of the excess street right-of-ways throughout the Mission. Turning these concrete and impermeable surfaces into pocket parks and plantings will not only beautify the street, it will also provide greater on-site water filtration. Additionally, new public parks that are being acquired will consider incorporating ecological sustainability elements, such as bioswales and natural areas. Uncovering long-buried creeks would also substantially change the environment of the Mission. Mission Creek once meandered from the base of Twin Peaks down to through the Mission and along Division to Mission Bay. Future consideration should be given to daylighting some elements of this historic streambed. Increase the environmental sustainability of the Mission’s system of public and private open spaces by improving the ecological functioning of all open space. Explore opportunities to uncover Mission Creek’s historic channel through the Mission. Throughout the community planning process participants have given a high priority to maintaining and renovating existing park facilities. Maintenance needs will only become more apparent with the acquisition of a new park and as more open spaces such as green connector streets, living streets, and pocket parks are constructed. These types of spaces are often more complex and therefore generally more difficult to maintain on a per square foot basis then an open field, so the city should work to find space for maintenance equipment in the Mission area and to assure that maintenance funding and funding to renovate existing parks is provided with the development of these spaces. This plan proposes to renovate at least one existing park by securing the funding through impact fees and other sources. Specifically in the Mission, the majority of the area’s parks are in need of renovation including the Mission Playground (which is being prioritized for funds from the recently approved open space bond), Garfield Square, James Rolph Jr Playground, Juri Commons, Jose Coronado Playground, Franklin Square, Alioto Mini Park, and the Mission Recreation Center (See Map 5 - Eastern Neighborhoods Streets and Open Space Concept Map). Parque Niños Unidos, Kidpower Park, and 24th and York mini park were recently renovated, so are not prioritized for renovation at this time, but over the life of the Plan renovation is anticipated for these parks as well. The Recreation and Parks Department (RPD) is now using, safe, durable and long lasting materials and are designing facilities appropriately for the intended uses and these efforts will result in fewer repairs, longer and expanded usage periods and more reliable facilities. New public parks and re-designs of existing public parks should maximize drought tolerant landscaping and minimize features that require regular irrigation. Native species are encouraged, where appropriate. There are also opportunities to more efficiently and creatively utilize existing facilities, such as school playgrounds, in the Mission. The Mayor’s Office and the San Francisco Unified School District have recently begun a pilot program to open one school playground in each supervisorial district for use on weekends and select holidays. This program better utilizes our existing resources and the city should continue to work with the School District to expand this program. Prioritize funds and staffing to better maintain existing parks and obtain additional funding for a new park and new open space facilities. Renovate run-down or outmoded park facilities to provide high quality, safe and long-lasting facilities. Identify at least one existing park or recreation facility in the Mission for renovation. Business assistance forms a vital part of an overall strategy to help San Francisco’s business sectors grow, compete and succeed. Business assistance is provided by a city or a non-profit organization and often broadly includes start-up assistance, ongoing technical assistance, assistance navigating city government processes, financial assistance, real estate and site selection assistance, assistance accessing workforce and incentive programs and assistance forming sector specific industry associations or organizations. In the Eastern Neighborhoods, there are three broadly defined industries: Physical Infrastructure, the Knowledge Sector, and the Small Business Sector. Workforce development strategies will target a range of established and growing industries. These industries reflect the breadth of San Francisco’s economy, and include Physical Infrastructure jobs and Knowledge Sector jobs (as discussed above), as well as those that are more involved in the “Experience Sector” (i.e. tourism and hospitality) and human services. These sectors are specifically targeted because of their ability to pay above-average wages to well-trained workers, even if those workers do not have a four-year degree. Employers range from small neighborhood serving businesses to large and mature companies. Community facilities are key elements that can help to create a strong sense of community and identity. They are an integral element of socially and sustainable communities and they include community anchors like schools and libraries, child care facilities, community centers (where youth, after school, and other activities can occur), cultural and arts centers, clinics and a range of other amenities. Community facilities can include any type of service needed to meet the day-to-day needs of the community. In the Eastern Neighborhoods these facilities can provide language/communication curricula programs to address education gaps, job skills and training, tutoring and youth development, cultural resource centers, and the support networks often so critical for lower income communities. Specific needs might include multicultural programs, legal aid, information and referral, various parenting groups, immigration adaptation and settlement, etc. Some community facilities critical to neighborhood development, such as streets, open space, housing and transportation, are addressed specifically in other sections of this Area Plan. This Community Facilities chapter includes the remaining needs and attempts to address how they will be met either through traditional land use regulations or through other methods to fund, encourage and maintain them. In the Eastern Neighborhoods, the expected level of need for these community facilities is based on existing needs as well as future ones, derived from projected population growth and new development demand. Recommendations towards expansion or improvements to community facilities are based on this assessment, as well as on conversations with the community and with typical providers of a these community services. The policies that follow will be accompanied by a separate implementation document, which will outline funding strategies and public benefit funds available for such facilities, and provide direction for their execution. The Plan will also include a monitoring strategy to assess changes in needs so that the pool of funds for public benefits can be allocated efficiently and based on community priorities. The Mission is an economically and demographically diverse community. There is a significant amount of housing in the Mission and it is expected to increase with the implementation of new zoning controls. For both the existing and new residents, community resources will be a priority to ensure the area’s livability and to provide a full range of services and amenities. Existing facilities should be maintained and strengthened, while new facilities can enhance the neighborhood and fill existing gaps in service. New residents will increase the need to add new facilities and to maintain and expand existing ones. Community facilities are necessary for many kinds of households, but particularly for families - improved schooling, upgraded libraries, improved and expanded parks, and increased child care facilities, including programming, are critical to maintaining an acceptable quality of life for San Francisco’s families. Schools provide an anchor for families even beyond education: providing a safe local environment, facilitating social connections, and facilitating child growth and development. Public libraries too, play a critical role in community life. Library branches can contribute to the social fabric of their communities by serving as a distribution point for community information, by promoting social networks, and by providing access to the internet and to digital networking. The community libraries at the Mission, Potrero, and Mission Bay Branch provide reasonable access to the residents of the Eastern Neighborhoods, but the projected increase in population could add to the need for existing libraries to provide additional materials. Therefore, maintenance as well as planning for additional materials is another important consideration in the allocation of community benefits. Child care facilities, like schools, can be strong neighborhood and community anchors. Locating child care in schools, near residential areas, on-site in new residential complexes, near transit facilities, or near employment centers, supports families by reducing the time spent by parents going to and from daycare. This may also contribute to other plan goals such as traffic reduction, and increased transit ridership. Sufficient care facilities for the neighborhood’s working families are critical if the Eastern Neighborhoods are to not only continue, but grow their role as a place for families. Therefore, the city should facilitate the careful location and expansion of essential neighborhood services, while limiting the concentration of such activities within any one neighborhood. New development can also help fund such additional new services and amenities in proportion to the need generated by new development. Additionally, maintenance is an important, though often neglected, aspect of community facilities. Proper maintenance of existing (and new) facilities is equally important to the creation of new facilities. The influx of residents will further increase the usage of existing facilities, potentially increasing their staffing and maintenance costs. Even if no new facilities are built in Mission, existing facilities need to be adequately staffed and maintained and methods for meeting the increased costs must be considered. Promote the continued operation of existing human and health services that serve low-income and immigrant communities in the Eastern Neighborhoods. Explore a range of revenue- generating tools to support the ongoing operations and maintenance of public health and community facilities, including public funds and grants as well as private funding sources. The Mission has long been home to Latinos whose numbers grew substantially from the 1940s onward. The development of Latino cultural institutions and businesses both dispersed and concentrated the Latino community in the neighborhood. A considerable number of Latino families live throughout the Mission. However, many families have also moved on to outlying parts of the City or other places but continue to look at the Mission as “home” – attending Sunday services at the Mission Dolores Church, shopping and eating in the local Latino businesses and dropping by the Mission Cultural Center for activities. Cultural and service facilities that support Latinos, such as the Mission Cultural Center, Arriba Juntos, Galeria de La Raza, Brava Theatre, and the Mission Language and Vocational School, to name a few, are key contributors to the diversity of the Mission and the city as a whole. In addition to the maintenance of existing facilities, new facilities that support the importance of Latino life and other cultures in the Mission such as English as a Second Language, employment, art, education and youth centers would provide additional support to strengthening Latino culture in the Mission. Encourage the creation of new social and cultural facilities in the Mission area. Protect and support Latino and other culturally significant local business, structures, property and institutions in the Mission. The heritage of San Francisco is preserved in its historically significant buildings, sites, districts, and other resources. These historic resources are important to quality of life in the city, and they help to make it attractive to residents, visitors, and businesses. They provide continuity to the events, places, people, and architecture of San Francisco’s storied past. Historic resources contribute to the city’s diverse housing and commercial stock, and to the human scale and pedestrian orientation of its neighborhoods. Plan policies should promote the identification, protection and rehabilitation of known and unknown historic resources to assure that they accommodate for current populations as well as future generations. The Mission District is particularly rich in historical properties, including several of the oldest and most important in the city. Just west of the Mission Area Plan boundary stands San Francisco’s oldest building and the district namesake, the Mission Dolores (1776), last intact remnant of the city’s Spanish-Mexican period. Also found scattered throughout the Mission District are farmhouses, cottages, and even barns of the settlers and farmers who occupied the Mission valley during the Gold Rush and the American pioneer period of the 1850s and 1860s. Examples include the Tanforan Cottages on Dolores Street (also located just outside of the Mission Area Plan boundary), two of the oldest extant homes in the city. Much of the Mission District’s building stock dates to the area’s development as one of the city’s first streetcar suburbs in the 1870s and 1880s. As new transit lines were installed from the growing city center to the outlying Mission, and as the old Mexican ranchos were subdivided, residential development in Victorian styles followed. The Mission’s proximity to the South of Market and the Central Waterfront areas, and the direct access provided by transit lines, fostered growth of a working-class population and character in the Mission. The city’s wealthy elite also found the Mission, particularly Howard Street (now South Van Ness Avenue), to be a desirable area for their estates and mansions. During the latter nineteenth century, the majority of the Mission was built out as a residential suburb. The Great Earthquake and Fire of 1906 destroyed the northern part of the Mission District, while the southern Mission was spared. In the vast area of the Mission that burned to the ground, a decade of furious reconstruction following the disaster largely replicated what had existed before, though modernized. The reconstruction building stock was taller and denser than the older stock, and rendered largely in Edwardian, Classical Revival, and Mission Revival styles. In the southern part of the Mission, where the Victorian-styled building stock was untouched by the 1906 fire, significant new construction also occurred during the reconstruction in order to meet the urgent needs of refugees. As the twentieth century progressed, the established commercial thoroughfare of Mission Street thrived and grew. Following the 1906 destruction of the downtown commercial center, Mission Street assumed a new role as a vital citywide shopping district. The surviving portion functioned while the burned portion was rebuilt. The corridor, which came to be known as the “Mission Miracle Mile,” was characterized by innovations in consumer-oriented architecture that developed during the twentieth century. Downtown department stores, furniture stores, movie theaters, and numerous other consumer-oriented businesses gravitated to Mission Street and spilled over to surrounding streets such as Valencia and Sixteenth. Following the post-1906 reconstruction period, the Mission District was largely built out and its population had expanded. To serve the larger population, construction of commercial buildings, public buildings such as schools, and community institutions such as churches, temples, and union halls continued through the first few decades of the twentieth century. New pockets of residential infill also appeared, designed in twentieth century styles such as Craftsman, Mediterranean Revival, and Deco/Moderne. Since mid-century, public and private redevelopments have altered the Mission’s older landscape. Changes in socio-economics have also occurred, including the establishment of Latino culture in the heart of the Mission, centered on the 24th Street commercial corridor. The Mission’s multi-layered heritage is distinguished by the existence of individually significant historic properties as well as by cohesive groupings that form historic districts. Within the Mission Area Plan, Article 10 of the Planning Code officially designates a number of City Landmarks, including the San Francisco Labor Temple, the Victoria Theater, the San Francisco Women’s Building (formerly the Mission Turnverein), and residences ranging from cottages to mansions. Article 10 also designates the Liberty Hill Historic District. Individual properties such as Mission Dolores, the National Guard Armory, and the California Trunk Factory are also listed in the National Register of Historic Places and the California Register of Historical Resources. Various other historic properties and districts, such as the Mission Reconstruction District, are identified through informational surveys and are listed in the statewide Historical Resources Inventory maintained by the California Office of Historic Preservation (OHP). It is expected that additional historic surveys in the Mission Area Plan will document a substantial number of previously unknown resources. The historic preservation objectives and policies of the Mission Area Plan provide for identification, retention, reuse, and sustainability of the area’s historic properties. As the area changes and develops, historic features and properties that define it should not be lost or diminished. New construction should respect and relate to the Mission’s historical contexts. The Plan regulates sound treatment of historic resources according to established standards, it encourages rehabilitation of resources for new compatible uses, and it allows for incentives for qualifying historic projects. As greater understanding of the Mission’s important historic resources is gained through ongoing survey and property evaluations, the preservation policies of the Mission Area Plan may be revised or augmented to incorporate the new information. Individually significant historic resources or historic districts are often identified by a historic resource survey or a historical context statement. While a number of historic resource surveys have been completed in the Mission Plan area (including the identification and Article 10 designation of the Liberty-Hill Historic District and the ongoing Inner Mission North Survey program), it is expected that additional historic resource surveys in the Mission Plan area will document a substantial number of previously unidentified historic resources. Historic resource surveys and historical context statements help the Planning Department determine eligibility of resources for designation at the local, state, and/or national level. Official designation in turn, fosters civic pride in historic preservation for the benefit of the Mission Plan area and the city as a whole. Materials, styles, and property types from the nineteenth and early twentieth centuries are more widely appreciated and studied than those associated with the recent past. However, there are some structures that have developed exceptional cultural or historic significance as part of our recent past. These resources - buildings, objects or landscapes - deserve consideration in the preservation process. The Planning Department will continue to develop historical context statements and to conduct historic resource surveys in the Mission to identify historic and cultural resources from the distant past as well as from the recent past. Conduct context-based, historic resource surveys within the Mission plan area. Pursue formal designation of the Mission’s historic and cultural resources, as appropriate. Significant historic and cultural resources located in the Mission Plan area include individual properties and districts that are listed on or eligible for the National or California Register, or that are designated as Landmarks or Districts under Article 10 of the Planning Code. These historic and cultural resources cannot be replaced if lost to demolition or altered in such manner their historic significance is diminished. To retain this significance, there are a number of ways to protect, preserve and reuse historic resources within the Mission Plan area. The established Secretary of the Interior’s Standards for the Treatment of Historic Properties provide guidelines for managing any change to a historic resource and for appropriately addressing historical materials, features, and character. In other instances, because many historic and cultural resources no longer retain their historic use, it is desirable to adapt historic resources to accommodate compatible new uses while preserving character-defining features. The Planning Department will support rehabilitation and the adaptive reuse of historic buildings within the Mission Area Plan pursuant to the Secretary of the Interior’s Standards for Rehabilitation. Protect individually significant historic and cultural resources and historic districts in the Mission plan area from demolition or adverse alteration. Apply the Secretary of the Interior’s Standards for the Treatment of Historic Properties in conjunction with the Mission Area Plan objectives and policies for all projects involving historic or cultural resources. Promote and offer incentives for the rehabilitation and adaptive reuse of historic buildings in the Mission plan area. New information regarding historic and cultural resources is discovered on a regular basis. As new information is compiled, it should be utilized to update and revise the policies set forth in the Mission Plan. It is also important that throughout the planning process, the Planning department work with various city agencies to ensure the protection and preservation of historic resources. Pursue and encourage opportunities, consistent with the objectives of historic preservation, to increase the supply of affordable housing within the Mission plan area. Consider the Mission area plan’s historic and cultural resources in emergency preparedness and response efforts. Another good resource for incentive programs and education is the Planning Department staff. The Planning Department retains a core staff of Historic Preservation Technical Specialists who are available to share expertise with the public and other government agencies. Because the City and County of San Francisco is the largest owner of officially designated landmarks in the City, the planning staff will work to share their expertise with other agencies to identify, maintain and rehabilitate the publicly owned historic and cultural resources in the Mission Plan Area. With the guidance of the Landmarks Preservation Advisory Board, the City will also lead by example and demonstrate good stewardship of its resources by maintaining, rehabilitating, and restoring its publicly owned historic resources within the Mission Plan area. San Francisco residents, merchants, and local historians may possess and have access to valuable historic information not widely known about buildings or other resources that would be useful in the evaluation process. The public can play an important role in identifying historic resources by participating in City surveys and context statement development or by submitting Potential San Francisco Landmark Evaluation forms to begin a formal designation process. Such participation can help to promote greater civic pride and awareness of the historic and cultural landscape of the Mission Plan area which is also helpful for the planning and environmental decision-making process. Encourage public participation in the identification of historic and cultural resources within the Mission plan area. Foster education and appreciation of historic and cultural resources within the Mission plan area among business leaders, neighborhood groups, and the general public through outreach efforts.